Cast, Crew, Parents: this is it. 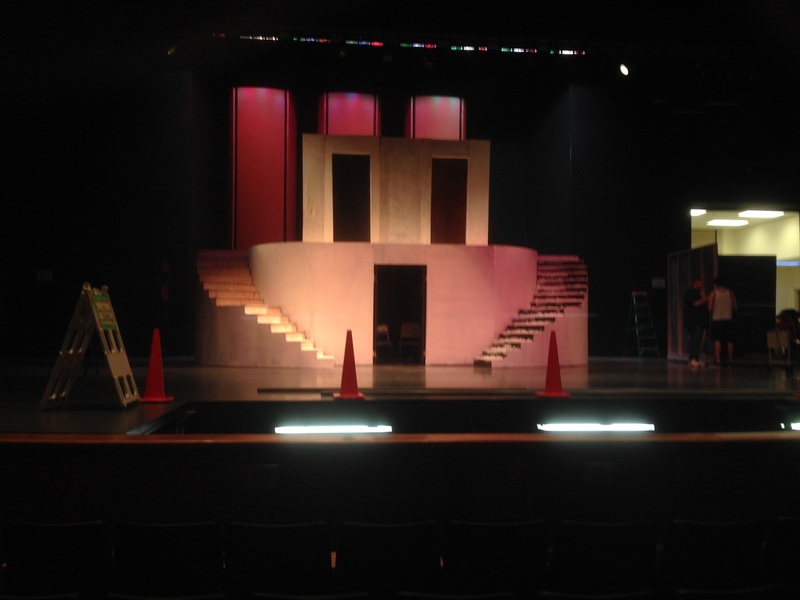 With only a few hours remaining to stabilize queues, finish set and lighting fixtures, and coordinate dance numbers, our production of Anything Goes! is nearly ready! This is a proud achievement, as any, and should be celebrated by everyone. However, before we hit the stage and ready our costumes and make - up, there are a few, final concerns. The set, particularly the state rooms / jail, are what is left before the entire S.S. American is complete (including some other final touches). While there may be limited time to join us backstage, we ask if anyone could spare time during their Choir classes or in between scenes / practices to help support the parents and students working tirelessly on construction. Any sort of help would be appreciated! Make sure to plan out what actions need to be made before opening night! Check if you have all your costumes and props ready so you don't go out on stage unprepared. Address these questions with those respectfully in the costumes or properties departments. The cast party is already underway and we have a lot of people bring a huge assortment of meals and desserts for the company! If you're at all interested, refer to the whiteboard backstage and note what you may (or may not) be able to bring on Sunday. As a reminder, the cast party will be held at Chris & Melody Baker's house after company strike! 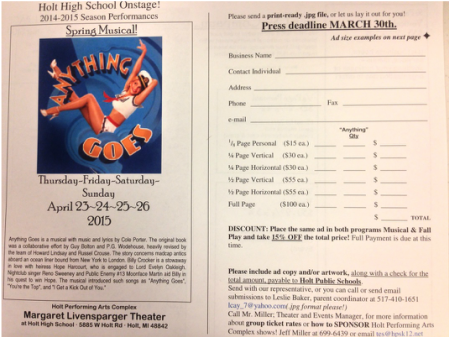 Check with the Anything Goes tab on location and other information. Finally, on a personal note, I wish to apologize for any issues that have rose during the dress rehearsals. I'm known to constantly run all over the place and ensure hell and chaos hasn't broken loose, and often spill my irritation onto other people in the process. I want you to know that you're all a wonderful cast with a great sense of potential, and that though we've faced many trials and challenges in creating this show, it's going to be a grand and memorable one nonetheless. I wish you all the best of luck on stage. Have any questions? What do you think of the outcome of the performance? Contact us on your thoughts about next year and what we can do to become a better community (if not the best already). We're open to hearing from the anyone, especially those who bring the magic from both on-stage and off-stage. 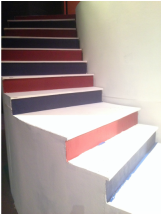 We're really pleased with how this weekend turned out with the scheduled set build! Originally going from 10:00am - 5:00pm, the students and parents working went above and beyond to staying an extra 4 hours behind to get some major work done! Even to having additional time on Sunday to work, the status of the sets are coming along nicely and will, no doubt, be ready for the performances this upcoming weekend with continued support! In case anyone is interested, pictures were taken of the ship exterior and state rooms. 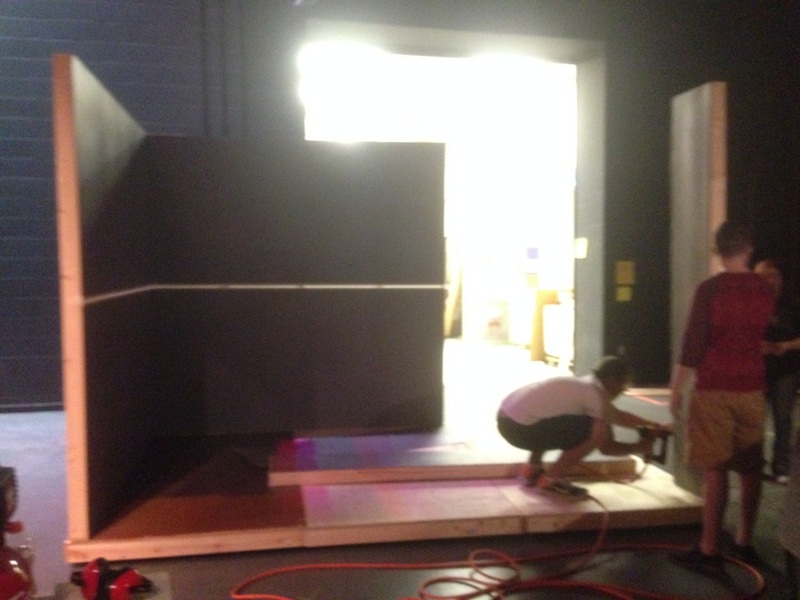 Feel free to take a peek and thank those who went out of their way to help speed along the construction of our stage! As a reminder, Dress Rehearsals begin this week and go from 3:00pm - 10:00pm, with dinner provided by parents in between runs. Make sure to ask your parents to bring meals if possible (we need all the food we can get for our cast!). There is a scheduled rehearsal on Wednesday during the Fine Arts Festival, primarily to work on queuing lines and practicing songs / dances before opening night. Everyone is expected to attend these rehearsals on time and with a positive attitude (trust us; you'll need it). Make sure to get enough sleep and pack snacks for your dressing rooms all throughout the week as we'll be working our best to deliver an amazing show! Note: Voting for the Cast Dinners end this Tuesday, April 21st! Make sure to cast your votes in on the website before it's too late! 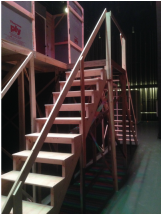 As an update to all cast and crew, the current status of the show's sets are still incomplete at this point in production, and we are desperately needing to finalize the ship set before dress rehearsal next week! In order to meet the requests of Mr. Bishop and Mrs. Morgan, there will be an opportunity to work backstage on ANYTHING needed to be done (whether it be getting the rest of your costumes together, checking for your props, building / painting the set, practicing dance numbers with fellow actors and actresses, or operating lights and sound from the booth) on Saturday, April 18th (10:00am - 5:00pm). Although this is an optional choice, we want to remind you that this is your show, and you are responsible for your own character. It's highly suggested you attend to confirm your belongings, or aid parents and students in set building. We're extremely close to making this a spectacular show, but we need everyone's help in order to make it successful! Dress Rehearsals commence next week, which extend practice from 3:00pm to 10:00pm. This means we'll be starting a complete run of the show immediately after school, and students should be prepared by applying make-up and costume backstage BEFORE 3:00PM!! We do not want to waste any time waiting for students to arrive late because of miscellaneous activities! Be sure to clear your calendar for next week; WE NEED EVERYONE! Regarding our dress rehearsals, make sure to remind your parents about dinner plans in between runs. Bringing any type of meals for the cast would surely help us get through the evening. Contact Mr. Bishop for more information on how you can help! To all cast members, we highly request you to get a hold of your director (Mr. Bishop) for help in advertising on our Anything Goes! playbill! With the show coming close to its performance dates (which are, incidentally, next week), we need to insure we can make the necessary funds our show demands! 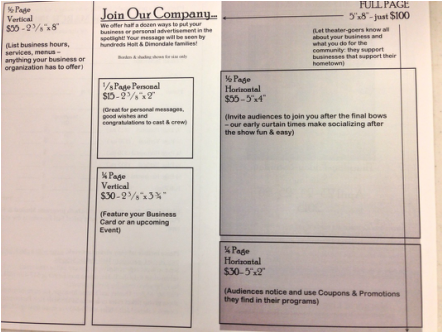 If you know anybody interested in advertising, being a parent, neighbor, manager, ANYONE who owns a business, please share with them these forms (located in this post), or request for original copies from Mr. Bishop ASAP! Make sure to also share posters and ticket cards with friends and family to spread word of the show! We're sure they'd love to see you perform with your fellow actors and actresses! All these materials can be found and accessed in the Choir Room at any time. Hopefully all of you are having a spectacular spring break! We already have huge plans prepared on our week back, and it heavily involves cast participation! Cast Dinners and the Cast Party are already underway. For the next few weeks, we are opening up a voting poll to decide where we will be taking the company after each performance (excluding Sunday for the Cast Party). Likewise, we are also asking actors and actresses to bring meals, snacks, and drinks for the Cast Party if possible (it's not a requirement, but would definitely allow for more options for the company during the event). The voting process will conclude on Tuesday, April 21st. As a brief reminder, the evening / dress rehearsals have been extended to Thursday - Wednesday (April 16th - 22nd), not including the weekend in between. Due to pressing deadlines and needing to perfect songs and dance numbers before the performances, these additional days will surely help the cast become more familiar with their material and allow for the backstage crew to complete multiple sets.  For those new to the Holt Theater Program, evening / dress rehearsals go directly from 3:00pm (after school) to 10:00pm. It is ABSOLUTELY NECESSARY that you arrive before 3:00pm to get into costume and have make - up ready for the dress rehearsals. We do not want to waste any of the time we may have on hand! Finally, to meet most expectations, we have dance recordings of both Anything Goes! and Blow, Gabriel, Blow! Unfortunately, there have been, say, "technical difficulties" posting the videos (through Weebly) in correct format, and will take additional time to prepare. If in any case, they will be prepared before and during the evening / dress rehearsals for practicing purposes. Hopefully you can all adjust to this unexpected delay. 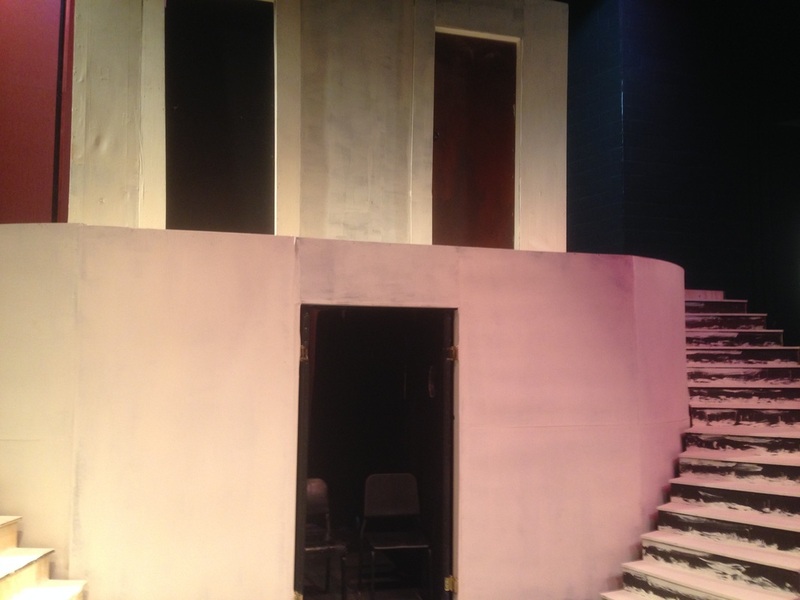 Remember, there are scheduled tech meetings during spring break (where students and parents can help build the sets for the show) and we are "supposed" to be off - book during this time. Do not bring your scripts on stage at any point in time! Most importantly, take time to memorize any content you are not comfortable with. As Choir Festival comes to a close, Mr. Bishop has made sure to give the cast a brief update on future practices. Although there were no practices throughout March 24th - 26th (due to after-school scheduling conflicts), cast members are still required to be OFF BOOK BY NEXT WEEK! It is entirely essential that all cast members are familiar with songs, lines, and company dance numbers taught by next week before spring break (this includes chorus equally to leads). There will be a regularly scheduled practice on Friday, March 27th, where as actors and actresses will have the opportunity to work on songs and dance numbers. Recordings will also be taken to be put on the website for practicing means. However, it should be noted that State Solo & Ensemble begins on Friday, and may cause for changes in scheduling. Make sure to check back in for further updates! Backstage crew is still looking for student and parent help! Mrs. Morgan is currently arranging dates during the upcoming spring break to work on the set, and will be posted on the Backstage Calendar subtab in the Tech & Crew tab. We would also like to thank the dedicated parents and students who have done so much for the show already, and hope they continue to support us in any way they can! Finally, there will be NO PRACTICE during spring break. We heavily advise you continue to practice your material (songs, lines, dances, etc.) and to be prepared when we return on Monday, April 13th. WE ARE OFF BOOK ON MONDAY, MARCH 30TH!!! This is a brief announcement to all actors and actresses and parents respectively. 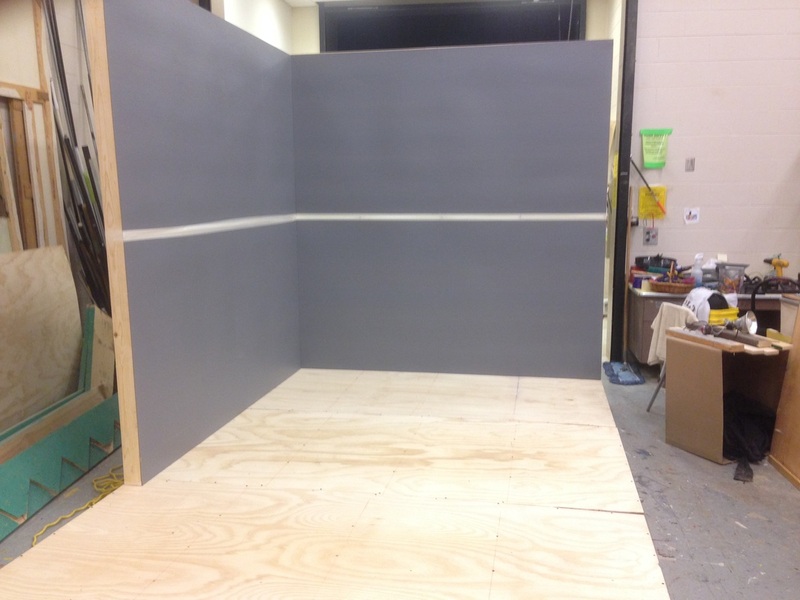 For the duration of Tuesday (March 10th) and Wednesday (March 11th) rehearsals, there will be a scheduled mandatory Company Set Build, where cast members will be actively working backstage either on their Crew Assignments or helping Mrs. Morgan on constructing the set for the show. We highly encourage the cast to invite family and friends these next two days to support the show in any way they can! To actors and actresses unfamiliar with their "Crew Assignments", all information can be reviewed under the Crew Assignments tab, being from designated roles to responsibilities given in each category. Make sure to speak to your crew leader on what objectives need to be met before the show this April! Due to recent developments with the cast rehearsals and backstage conditions, Mr. Bishop has changed the dates for the showing of Anything Goes! from April 16th - 19th to April 23rd - 26th (times of showings remain unaffected). This decision was made to accommodate the cast to make sure they had time to familiarize themselves with scenes after spring break, as well as to have additional time for backstage crew to complete the set. We deeply thank each and every parent and student who have already sent in submission forms to help backstage. Mrs. Morgan is excited to work with all of you in the coming weeks with now more hands backstage. However, we're still looking for more participants, and if you know someone who is willing to help aid our performance (friends, family, neighbors, etc. ), make sure to direct them to our website! To access more information on backstage crew, go to the Tech & Crew tab to learn more on the backstage schedule, who is responsible for what, and where you can sign up. We are glad to announce that a complete outline of both the Rehearsal and Backstage Crew Schedules have been updated and posted on the website respectively within its categories. Both Mr. Bishop and Mrs. Morgan have given detailed info on times and objectives for the weeks ahead, and hope you find them effective for future planning. If you wish to access these schedules, the Rehearsal Schedule can be found in the Anything Goes tab and clicking on the Rehearsal Schedule subtab. To access the Backstage Crew Schedule, go to the Tech & Crew tab and click on the Backstage Calendar subtab. Both should be operational in either the website or mobile formats. NOTE: There is regular scheduled after - school practices during ACT testing week, including adjusted class hours on Thursday and Friday. Ask Mr. Bishop on further information regarding plans / objectives needed to be met by both your crew assignments and script material. 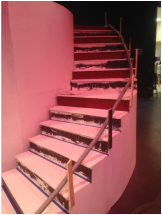 Make sure to also update your parents on helping backstage throughout the next coming weeks; we need extra hands on set construction or else it will be impossible to complete before the show this April! Ask friends and family if they are interested in helping! We're proud to see how well each cast member has performed with the recent installment of Crew Assignments! It's encouraging to see progress behind the scenes with everyone putting forth amazing effort. As so, we've added on a Crew Assignments tab that includes detailed descriptions on what each profession has to offer and what is necessarily expected. This will surely continue onto future shows next year, so make sure to leave a great example of your work! The Backstage Crew Calendar has been posted and updated according to Mrs. Morgan's current expectations. From Week 5 up to post production, the entire calendar can be viewed by the Tech & Crew tab and clicking on the Crew Calendar subtab. This is also a reminder to all actors and actresses to SHARE THIS INFORMATION WITH YOUR PARENTS!! We will surely need extra hands around, especially when we come close to the dress rehearsals later this April! Refer to the Sign Up forms in the Tech & Crew tab and clicking on the Sign Up subtab. Alternatively, you may use the button below to quickly access the page. Remember to share the website with your parents as soon as you can, and to grab a copy of the Crew Calendar either backstage or via Rachel Stacey. We appreciate any help you or your family is able to offer! Here you'll be able to find rehearsal information, extensions, cancellations, and other miscellaneous, show - related material.